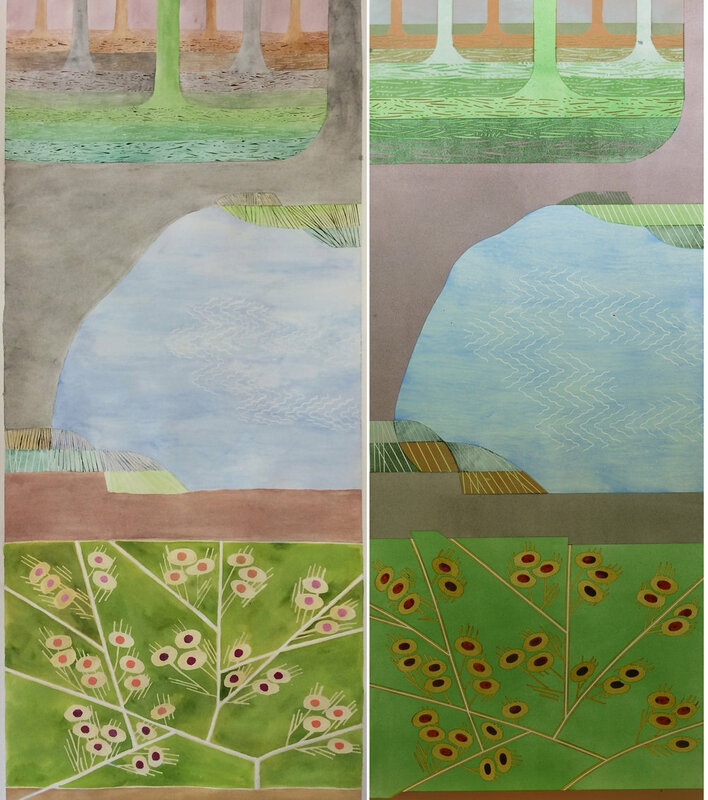 Below is window panel three from a set of four with the watercolour design on the left and the completed glass on the right. I’ve put these images side by side because I feel as if I’ve made progress over the years in showing clients a design that gives a good indication of what the finished glass will look like. I’ve just completed the panels, but it will be a while before I get photographs of them installed so I thought I would look at the progress of ideas from paper to glass. One of four panels for a private house, 1200 x 460 mm. Left watercolour, right glass. A collage, partly shown below left, was one of my early designs and it turned out to be the key to sorting out this composition. The quality I copied from the paper to the glass was the contrast between a matt neutral ground and pools of pale, decorated, transparent colour. In glass terms, this became sandblasted dirty pink ground (a great new enamel colour mix) against a very transparent hand painted blue pool. Central section of panels 3 & 4. Left collage, right glass. In another watercolour/collage, below left, I worked out some details and found a new pattern to suggest a wooded background. I didn’t really like the overall look of this design, and was surprised when I put it against the glass in progress, below right, to see how much I had stuck to my original shapes. These two glass panels on the lighbox before their first firing show how much the colour of the enamel changes when fired. Panels 1 & 2. 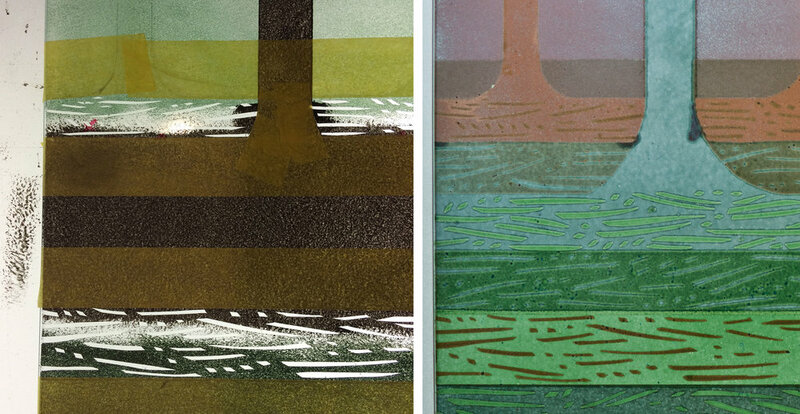 Left watercolour/collage, right glass panels on the lightbox before firing. When I look at a photo (below left) of the first, unfired layer of enamel I used to create the background, I can hardly remember how I did it. I can see the drawn lines are the same in the finished version (below right) and I have my notes, which tell me that the brown turned grey and the green went pink - as planned obviously! Background detail. Left on the lightbox before firing, right same section completed. A third comparison (after paper to glass and unfired to double fired) is from artificial to natural light. The panels will be installed in an existing four light window with a light box behind each one. The colours work much better in artificial light - as planned obviously! You can see this in the photos below. However, when the glass has daylight behind it my original concept, matt ground against pale pool, is really emphasised and gives me something I want to take into my next piece of work. Top half of the glass completed. Left on the lightbox, right against the window. Ten versions of my design for the left hand door, the design is mirrored for the right hand one. The epic sandblasting project is for the Moravian Church in Malmesbury, Wiltshire, currently being renovated by the Friends of Athelstan Museum. My brief was for a design to be sandblasted onto two huge (2.5 x 1.8 m) internal sliding glass doors at either side of the building. The design chosen by the Friends from my initial sketches is the one that was considered the most simple - top middle in the set above. Computer cut adhesive vinyl stencils, weeding out the design before applying stencils to glass. There will be more about the design and the building itself when the renovation is finished, this post describes the process we used to sandblast the doors. Normally I do my sandblasting in a booth in my shed or, for bigger projects, at a glass processing factory. In this case we wanted to avoid moving the heavy toughened doors from place to place, so all the stages had to come to the glass which was laid out on pallets under a carport belonging to the hospitable building contractor. The photos below show the glass in the picturesque carport, we have applied the stencils and in the back corner Ray is tidying up the edges. Glass doors covered with vinyl stencils under a carport near Malmesbury. To do the actual blasting I hired Terry who had a generator towed by his van, in the back of the van was the hopper full of white blasting grit. I banged the hopper (every type I have ever used seems to get blocked at some point) while Terry blasted the panels. The workplace was filled with beautiful colours - pink van, yellow stillage and hose, blue stencils, purple carpet - although for once the artwork would be monochrome. Lifting a corner of the stencil to check the sandblasted marks; glass arrives at the Moravian Church. Stencils are pulled off the glass and discarded in a heap. The glass doors were taken straight from the carport to the church and installed in channels on the floor and the balcony above. I saw them in daylight (below right) then changing in tone and throwing shadow patterns when the sun came out (below left). When the doors are in the open position, they slide across a row of white cupboard doors so the design is always on view. The quality of the sandblasted detail is excellent and everyone is pleased with the result. The doors look just right for the space and I’m looking forward to seeing the beautiful interior fully renovated. In 2011 Yeovil District Hospital refurbished the Haematology and Oncology Department and asked me to design various artworks spread throughout the suite of treatment, consultation and waiting rooms. They are printed on a variety of materials; transparent window vinyl, vinyl wallpaper, fabric for screens and paper for wall boxes. 2018 has brought a second refurbishment and more opportunities for my work in the new department. Digitally printed vinyl wallpaper outside consultation room and in waiting corridor. I find revisiting old commissions nerve wracking - have they stood the test of time and do people, including me, really like them? What I liked on this revisit was my design, based on wavy lines and filled in with peaceful colours, that links all the different artworks (above). The wallpaper still looks good on the corridor walls, although I wish Dr. Bolam would put his board elsewhere. I particularly like the corridor wall where you can see the waves starting with a shallow curve at the bottom where they hug the crash rail and swelling with life as the curve increases towards the ceiling. The wavy lines were the basis for the new work, but this time I pulled them apart and upside down so they float around in a looser formation. There is more wallpaper, some printing on acrylic and even some glass panels. The design flows across these different materials (above left), in the middle the glass square glows with backlit colour (below right). It was so exciting actually making some glass for a change, see the sample with layers of vivid colour on the sandblasted surface (above right). As usual, the sample was a quite different colour from the real thing. I opened the kiln (below left) and marvelled at the fantastic, luscious pink surface - just one firing! Glass square in the kiln after firing: during installation in the newly papered entrance wall. Detail of the finished glass square (575 x 575 mm). The second glass panel was for a screen in the waiting area. I made this piece over a weekend - every process went smoothly including installation and admiration. In the design for this one, and by the way the design takes far longer than the manufacture, I took out the wavy lines one by one until only two remained to link this artwork to the others. 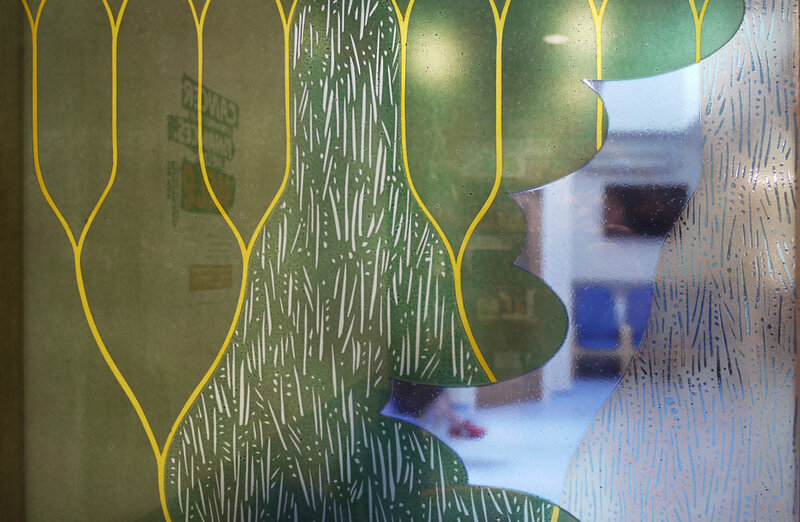 Detail through screen, showing hand cut, painted and printed detail in transparent enamels.